On Friday, December 21, a portion of East Loop Road between Parking Structure 1 and Lot C will close for repairs. 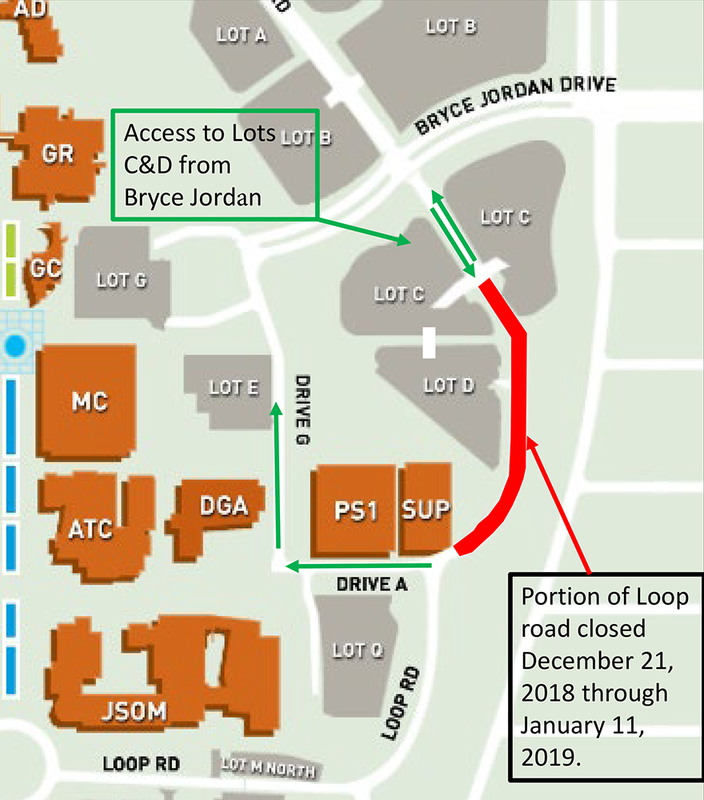 Access still will be available to Lots C and D on Loop Road from Bryce Jordan Drive. This section of Loop Road will re-open Saturday, January 12, 2019. Please pay close attention to traffic signs and exercise caution when traversing this area. The final nighttime concrete pour at the new Science Building’s construction site is set to begin 11:00 p.m. Wednesday, December 5, and will last about 6 hours. Crews have been instructed to use sound blankets to dampen the noise and to ensure that work lights are not pointed directly at the apartment buildings or residence halls. They also plan to position the pump truck to get its sound pointed away from living quarters. 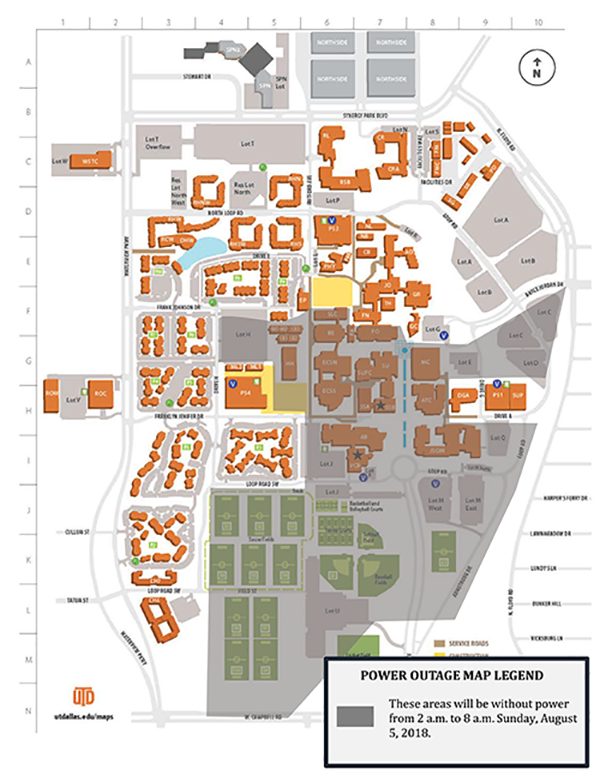 A second electrical outage to replace electrical switchgear in the Lloyd V. Berkner Hall (BE) will take place from 7 a.m. Wednesday, December 26 through 7 p.m. Sunday, December 30. 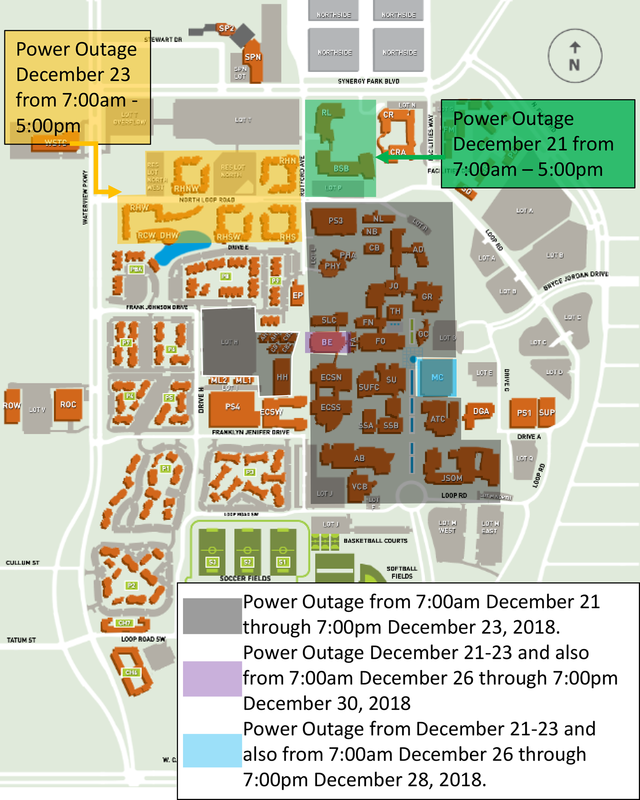 A third electrical outage to replace a main distribution panel and a transformer in the Eugene McDermott Library (MC) will take place from 7 a.m. Wednesday, December 26 through 7 p.m. Friday, December 28. 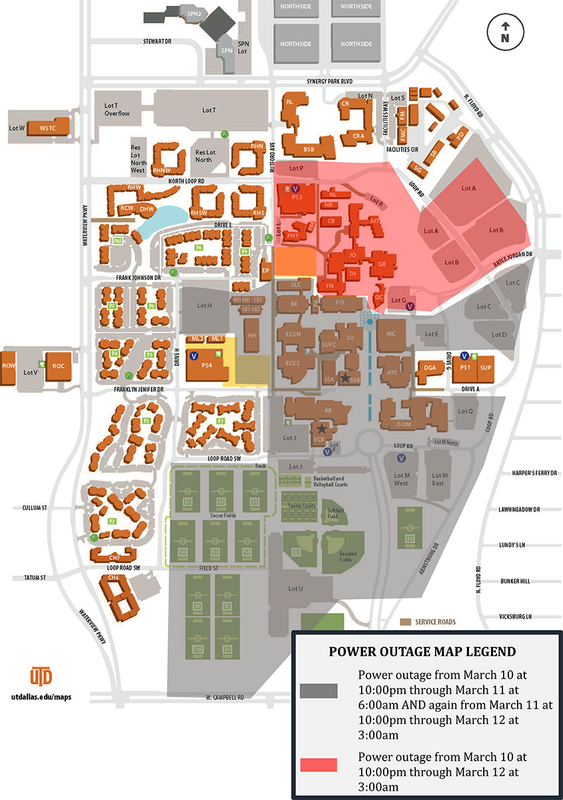 The power will be off in the northern half of each floor within the library. Emergency power will be available at the usual locations. Anyone with equipment in these buildings should take the necessary precautions to make sure it will not be affected during the shutdown. Please make sure that all computers and any sensitive equipment are turned off to prevent the loss of critical information. 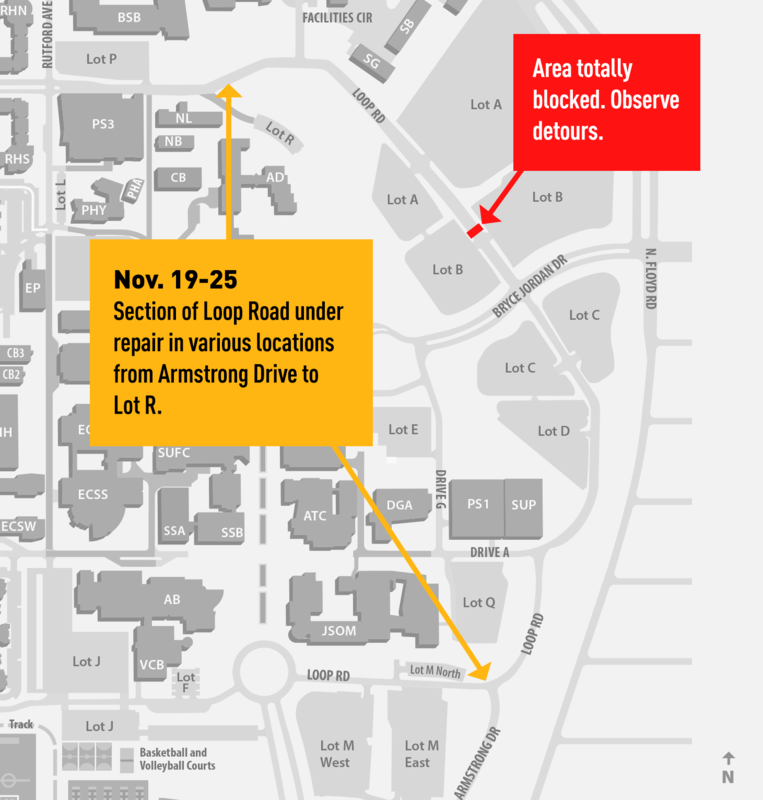 Starting Monday, November 19, crews will be repairing various sections of Loop Road on the east side of campus, from Armstrong Drive to Lot R. Most of the repairs will be isolated to small sections of the road, allowing one lane to remain open to traffic. A small area at Loop Road and Lot B will be completely shut down. Signage and flagmen will be in place, and detours through Lots A & B will be in effect. Those traversing or parking in this area are urged to exercise caution during this time. Please allow yourself extra time to park, slow down and observe all construction signage. Weather permitting, repairs are expected to be complete by Sunday, November 25. The athletics concession / restrooms building and partial parking spaces along the northwest side of Parking Lot U will be closed for seven months, beginning Monday, November 12, to allow construction crews to complete a new concession / restroom facility. The Comet Cabs and patrons may continue to use the parking spaces and walkway along the east side of the construction fence. Pedestrians in the vicinity of the construction area should exercise caution and observe safety barricades and signage. Please contact Supat Rachavong (sxr052200@utdallas.edu / 972.883.2123), facilities management project manager, with any questions. The outage will continue to impact the Jonsson Academic Center (JO) and Founders North (FN) until noon Sunday, November 25. 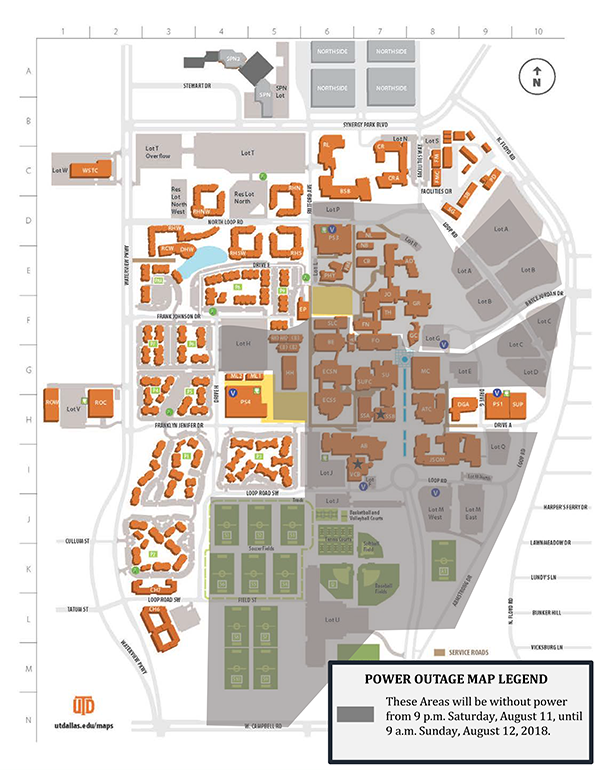 Everyone in the buildings listed above is encouraged to take the necessary precautions to ensure that equipment will not be affected by the outage. Please make sure that all computers and sensitive equipment are turned off to prevent the loss of critical information. Maintenance work to correct a drainage issue will force the closure of the southbound lane of Rutford Avenue at Franklyn Jenifer from Friday, October 12 until Wednesday, October 17. A portion of the northbound lane will also be affected. During that time, carts and the Comet Cabs will be the only vehicles allowed on Rutford Avenue from Franklyn Jenifer to Drive D.
On October 17, the full northbound lane will open; the southbound lane will open a few days later once the concrete has dried. Due to rain, maintenance in Lot H and Lot I will continue throughout the week, weather permitting. Lot W, Lot R, and Lot L will undergo maintenance on Saturday, August 18. Throughout the summer, maintenance will be conducted on several parking lots to repair damaged asphalt and restripe faded markings. When possible, work will be conducted in sections so other areas of the affected parking lot can remain open during repairs. Some lots, however, will need to temporarily close for this work to be completed. 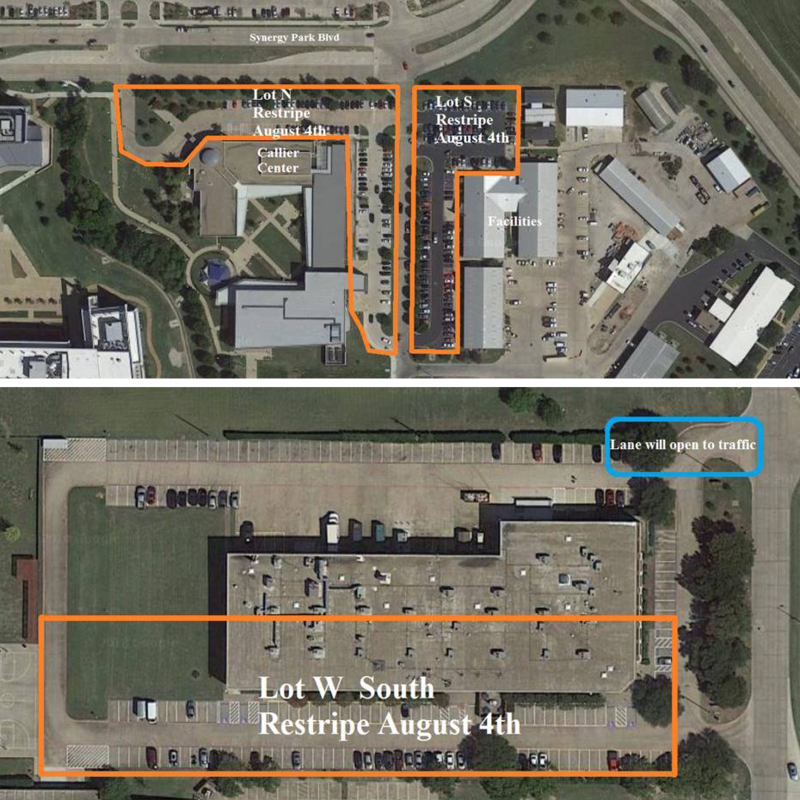 Monday–Friday, August 13-17: Lot H and Lot I Re-Stripe Painting (weather permitting). Saturday, August 18: Lot W (south portion), Lot R, and Lot L Re-Stripe Painting. Alternate parking for Lot W can be found in Lot T. Alternate parking for Lot R and Lot L can be found in Parking Structure 3 (PS3). Alternate parking for Lot H can be found in Parking Structure 4 (PS4). 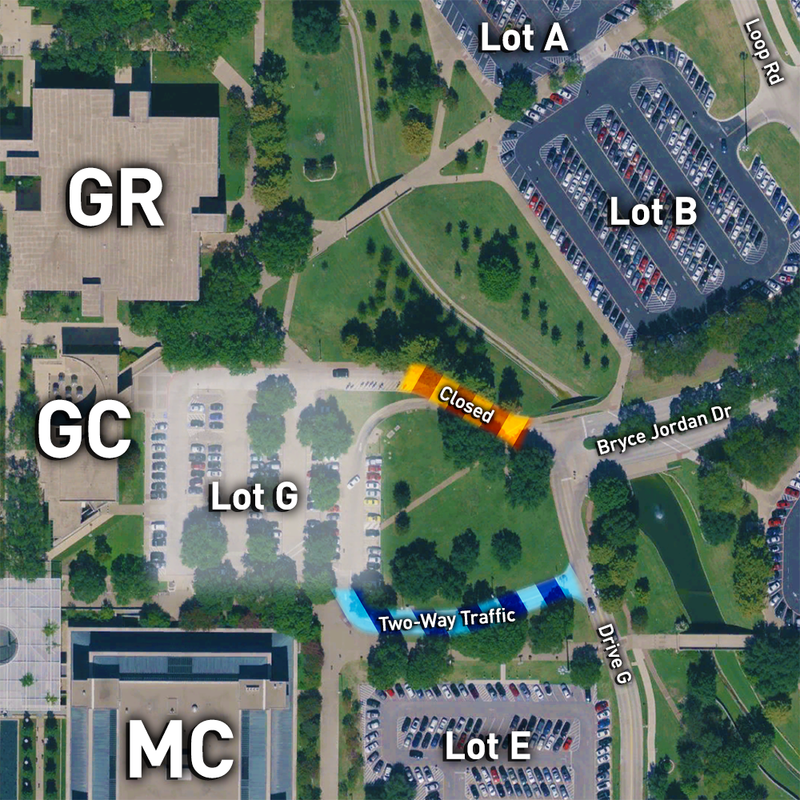 Please refer to the Campus Parking Map (PDF [Portable Document Format File] ) for more parking options. We are undergoing parking lot maintenance this summer and will be power-washing and re-striping all on-campus lots. Friday, August 10: Lot H Re-Stripe Painting. 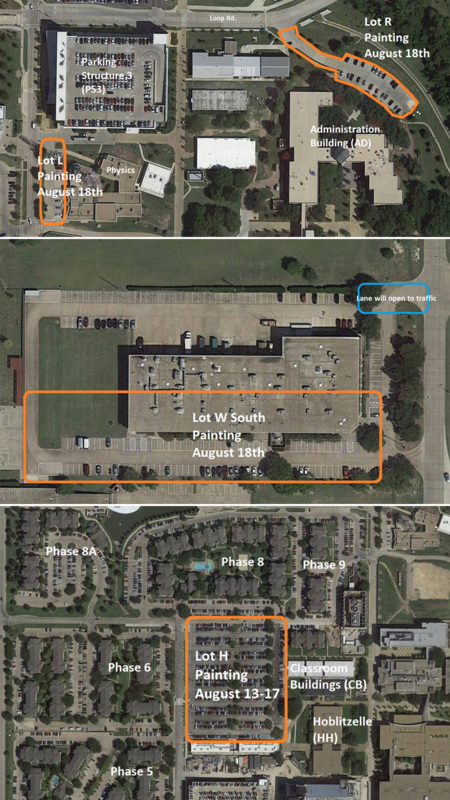 Saturday, August 11: Lot W South, Lot R and Lot L Re-Stripe Painting. Alternate parking can be found in Parking Structure (PS4) or Lot J while Lot H is closed. Alternate parking for Lot W can be found in Lot T. Alternate parking for Lot R and Lot L can be found in Parking Structure (PS4). We are undergoing parking lot maintenance this summer and will be power-washing and re-striping all on-campus lots. 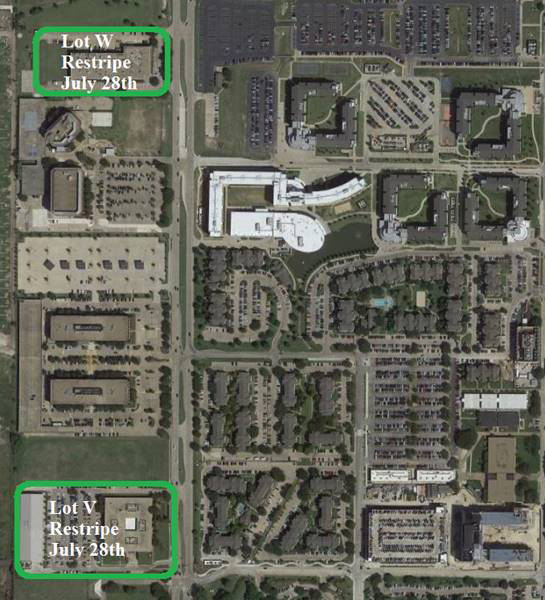 On Saturday, August 4, we will re-stripe Lot S, Lot N, and the south portion of Lot W.
To correct a critical electrical issue, power to portions of campus will be down on August 5, with a follow up outage on August 11-12. For safety reasons, no one will be allowed to enter the affected buildings during the outages. Everyone in the above listed buildings is encouraged to turn off all computers and sensitive equipment to prevent the loss of critical information. Emergency generators will operate normally. We are undergoing parking lot maintenance this summer and will be power-washing and re-striping all on-campus lots. Additional parking on these days may be found in Parking Structure 4 (PS4). On Saturday, July 28, we will re-stripe Lot V and Lot W.
Throughout the summer, maintenance will be conducted on several parking lots to repair damaged asphalt and restripe faded markings. When possible, work will be conducted in sections so other areas of the affected parking lot can remain open during repairs. Some lots, however, will have to close temporarily for the work to be completed. Additional parking on these days may be found in Lot J, Lot M West, and Parking Structure 4 (PS4). On Wednesday, July 25, we will re-stripe Lot F.
We are undergoing parking lot maintenance this summer and will be power-washing and re-striping all on-campus lots. 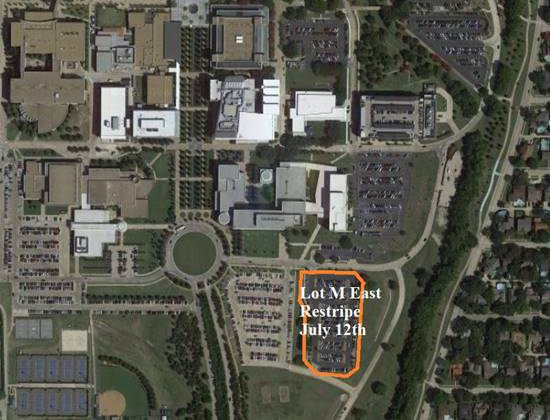 On Thursday, July 12, we will re-stripe Lot M East. 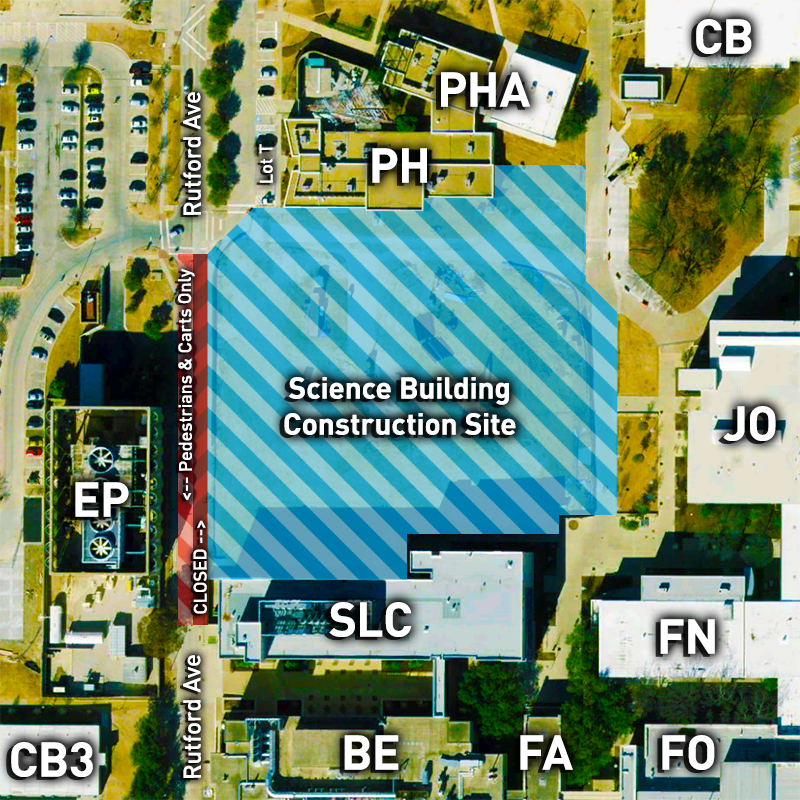 On July 20, 2018, a portion of Rutford Avenue from the northwest side of the Science Learning Center (SLC) to the northwest side of the Science Building construction site will close until the spring of 2020. This road closure is necessary to allow the Science Building contractor to access and build the west side of the building. During this timeframe, the northbound lane will close completely. The southbound lane will be barricaded, but will remain accessible to pedestrians, carts and emergency vehicles only. 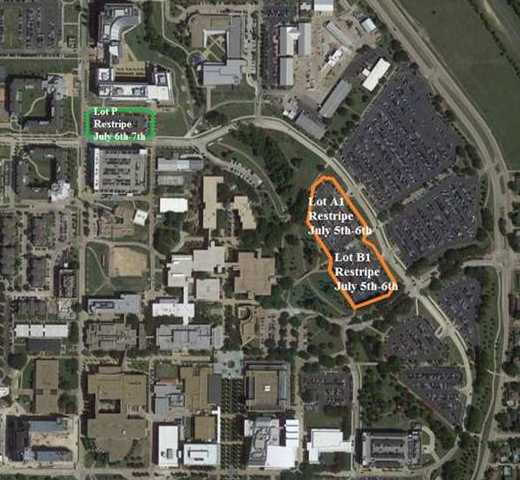 Partial road access will be allowed during campus housing move-in in August, and housing personnel will direct traffic through this area along the move-in route. Delivery drivers and those needing to access the handicap parking along Rutford Avenue can still do so by entering campus from Waterview Parkway onto Franklyn Jenifer Drive. 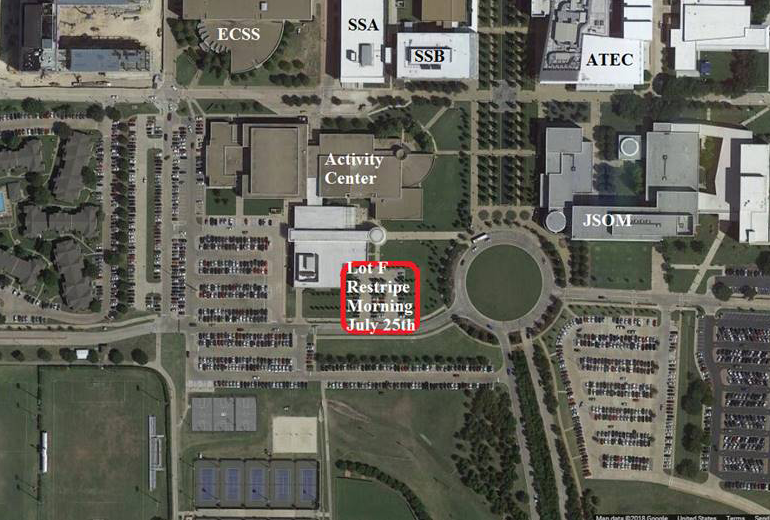 Thursday, July 5: Lot A1 and Lot B1 Re-Stripe Painting. 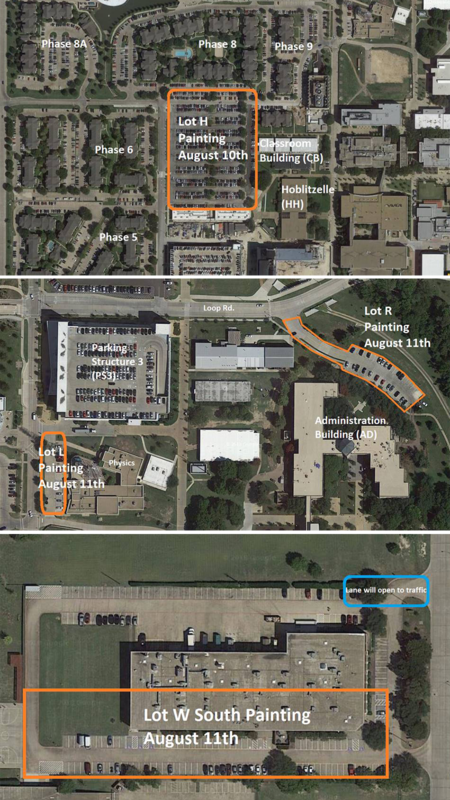 Friday, July 6: Lot A1 and Lot B1 Re-Stripe Painting. Friday, July 6: Lot P Sealcoat. Saturday, July 7: Lot P Re-Stripe Painting. Wednesday, June 27: Lot A2 Re-Stripe Painting. Thursday, June 28: Lot B2 Re-Stripe Painting. Friday, June 29: Lot T Extension Re-Stripe Painting. Tuesday, July 3: Lot C and Lot D Re-Stripe Painting. Wednesday, June 20: Phase 8A and 9 Re-Stripe Painting. 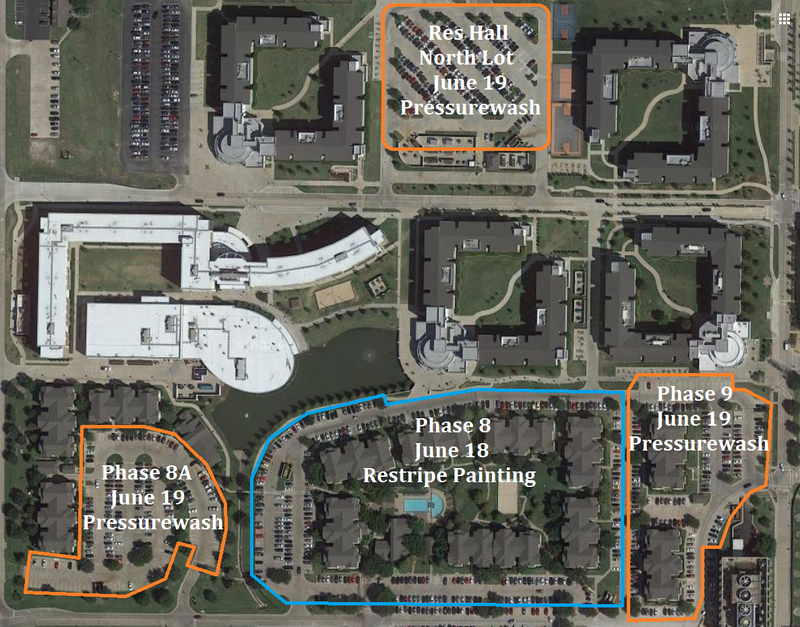 Thursday, June 21: Residence Lot Northwest Re-Stripe Painting. 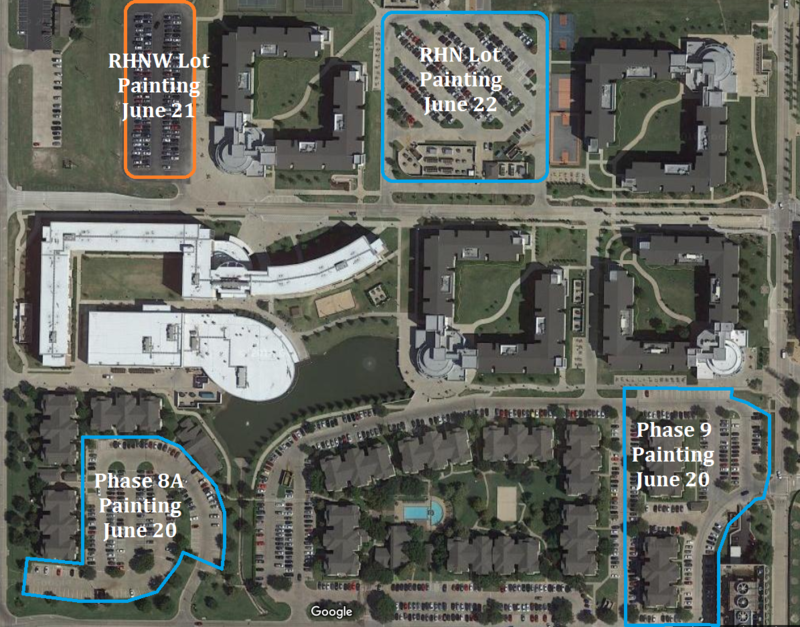 Friday, June 22: Residence Lot North Re-Stripe Painting. Monday, June 18: Phase 8 Re-Stripe Painting. If it rains, this work will be rescheduled to Tuesday, June 19. 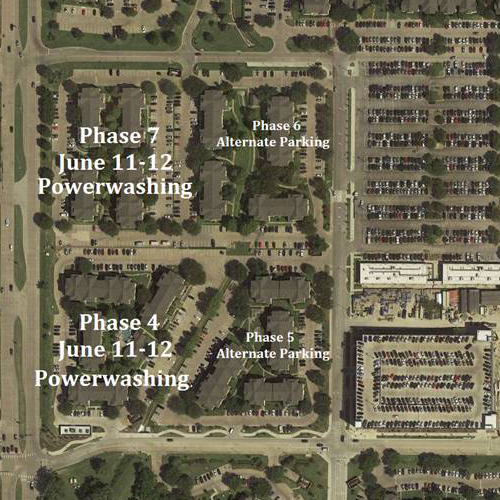 Tuesday, June 19: Phase 8, 8A, 9, and Residence Lot North Pressure Washing. If it rains, this work will be rescheduled to Wednesday, June 20. 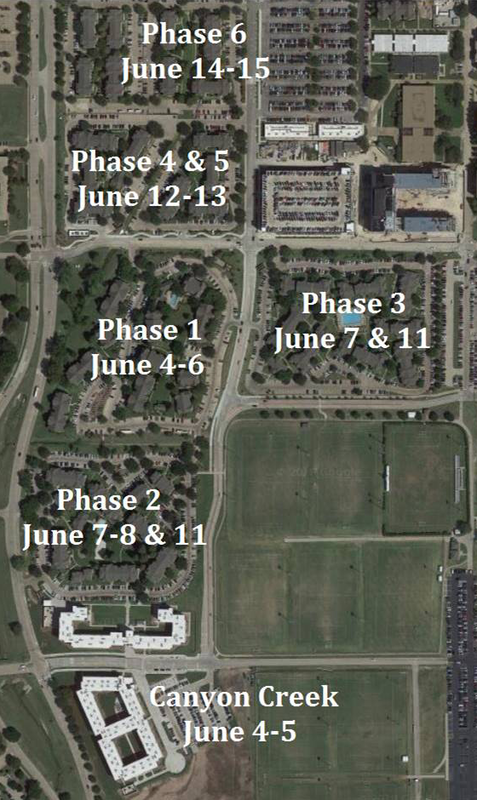 We are undergoing parking lot maintenance this summer and will be power-washing and re-striping all on-campus housing lots over the next several weeks. During these times, the affected lots will be unavailable for parking. Residents can find alternate parking in the other nearby apartment phases. This work is expected to be completed quickly —as long as all vehicles are removed prior to the work beginning. We ask your assistance in expediting this process by relocating your vehicle from the affected locations at your earliest convenience. Vehicles that are not relocated may be exposed to water or paint damage. We are not responsible for vehicles that remained parked in the affected areas while work is underway. 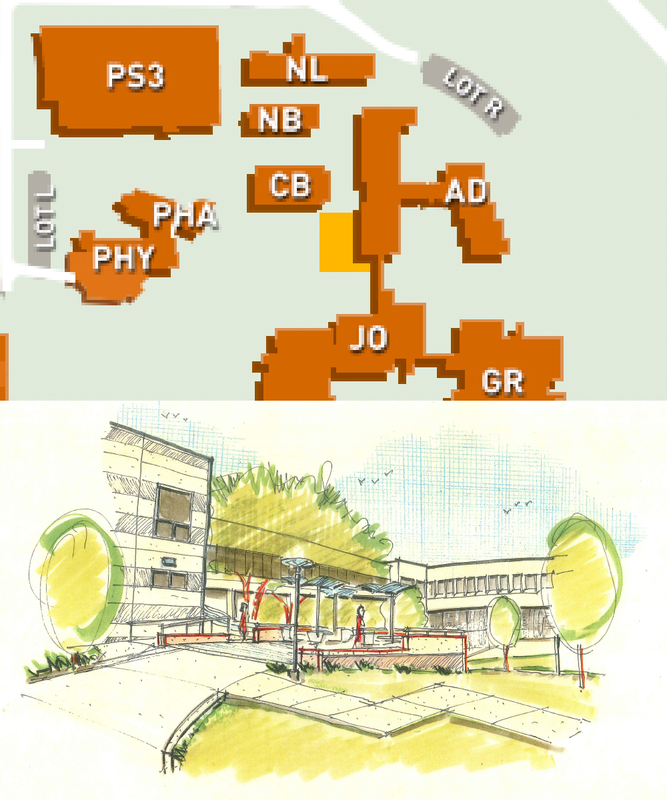 On Tuesday, May 29, construction crews will begin an exterior remodeling project to add a new seating area, sidewalks, bike racks, lighting and landscape adjacent to the southwest entrance of the Administration Building (AD). The area marked in yellow on the map will be closed to pedestrian and vehicular traffic during the project. While the southwest doors will remain open throughout the renovation, they will only be accessible from the staircase on the east side. Expect increased noise levels in the area and consider using alternate building entrances during construction. Weather permitting, the project is expected to be completed in mid-July. 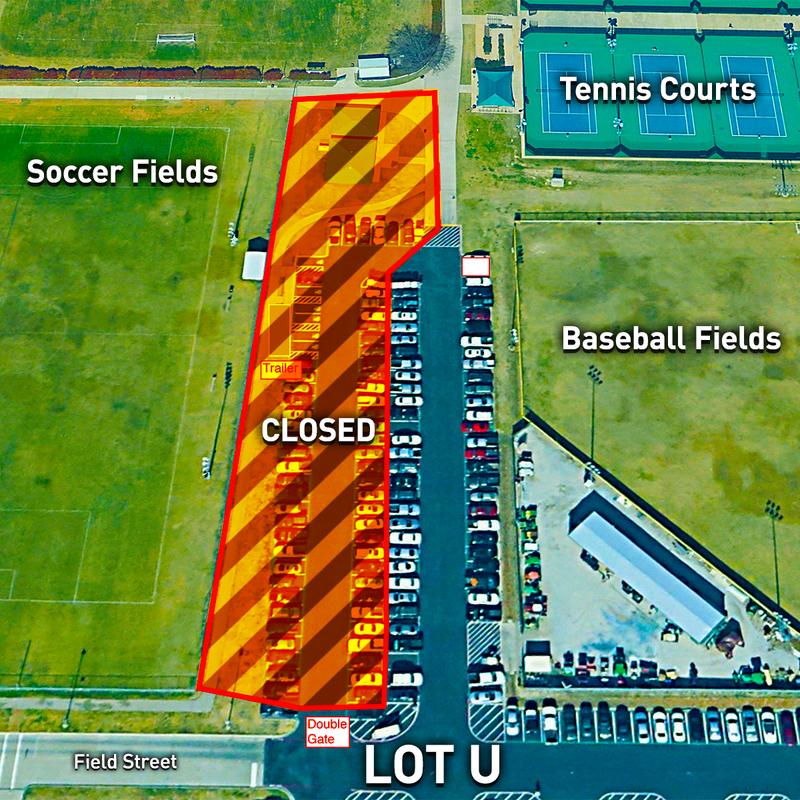 The eastern portion of Lot T, which contains commuter, faculty, and staff parking, will be closed for maintenance Monday, May 21, through approximately Monday, June 11. During this time, the lot’s entrances from Rutford Avenue and the Residence Hall North (RHN) parking lot will be closed as well. Drivers should enter and exit the lot from Waterview Parkway instead. Alternate parking can also be found in Lot P and Parking Structure 3 (PS3). Please continue to check the Parking & Transportation page for updates regarding the summer parking lot maintenance schedule. The area in red on the map will experience a power outage from 11:59 p.m. Saturday, May 19, through 1:00 a.m. Monday, May 21. 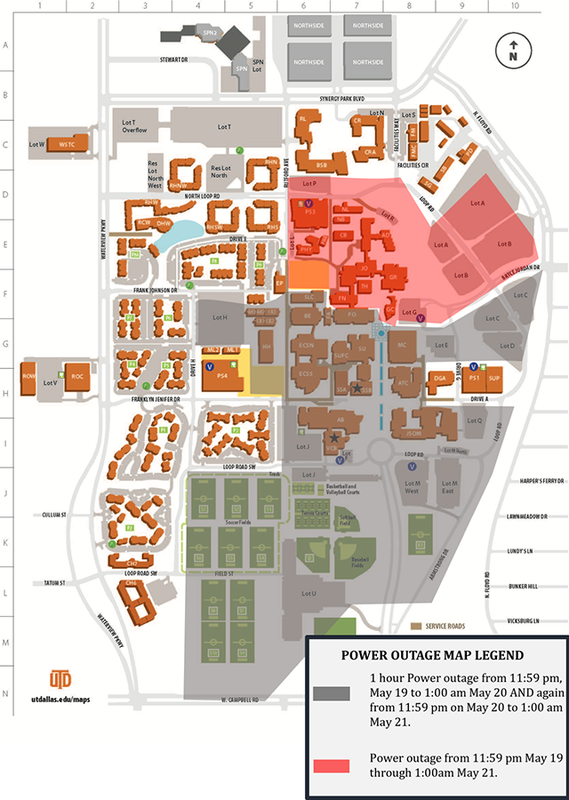 The area in grey on the map will experience a one-hour power outage from 11:59 p.m. Saturday, May 19, through 1:00 a.m. Sunday, May 20, and again from 11:59 p.m. Sunday, May 20, through 1:00 a.m. Monday, May 21. For safety, no one will be allowed to enter the affected buildings during the outages. Everyone in the above listed buildings is encouraged to turn off all computers and sensitive equipment to prevent the loss of critical information. Emergency generators will operate normally. For more information on campus maintenance and construction, please continue to check this site. 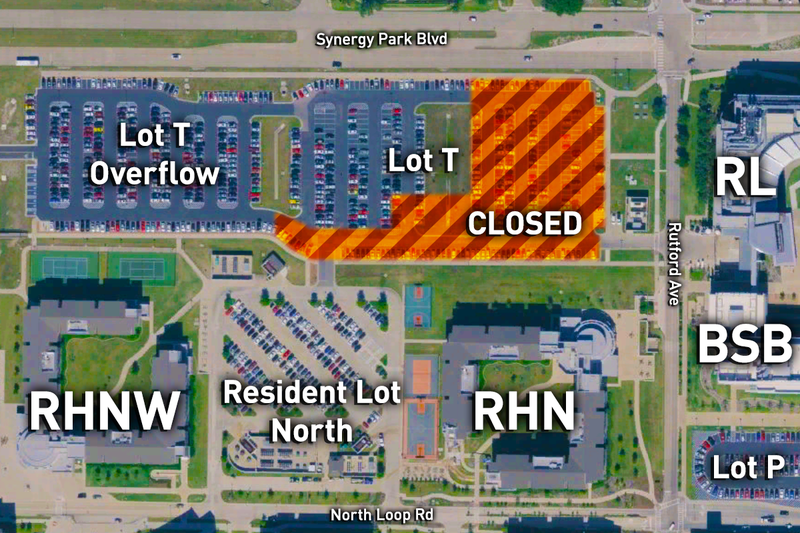 The north entrance to Lot G will be closed Saturday, March 10, through Saturday, March 17, for road and sidewalk repairs. During this time, the south exit to Lot G will be temporarily modified to serve as the primary entrance and exit point for the lot. Signs and barricades will be in place to direct traffic flow throughout the repair process. Once the repairs are completed, the north entrance and south exit will reopen with the normal one-way traffic pattern. Saturday, March 10 at 10:00 p.m. through March 12 at 3:00 a.m.
Saturday, March 10 at 10:00 p.m. through March 11 at 6:00 a.m. and March 11 at 10:00 p.m. through March 12 at 3:00 a.m.
For more information on campus maintenance and construction, please check this site. Everyone in the above listed buildings is encouraged to take the necessary precautions to ensure equipment will not be affected by the outage. Please make sure that all computers and sensitive equipment are turned off to prevent the loss of critical information. Emergency generators will operate normally.